What It’s About: On Thursday the 12th, John (Richard Benjamin) and Mary (Paula Prentiss) move into an old, spooky house they just inherited. Their kids don’t appreciate it, but when Billy (Kevin Brando) opens an old book he finds, The Book of Evil, releasing the monsters contained within. Can he find the book and find a way to stop the monsters? Will his family believe him, or even notice? What do vampires Waldemar (Jeffrey Tambor) and Yolanda (Nancy Lee Andrews) want with the book, and can the family trust Van Helsing (Severn Dardin) who arrives on Friday the 13th when they call an exterminator? Will anyone survive the family housewarming party on Saturday the 14th? Why Watch it Today? 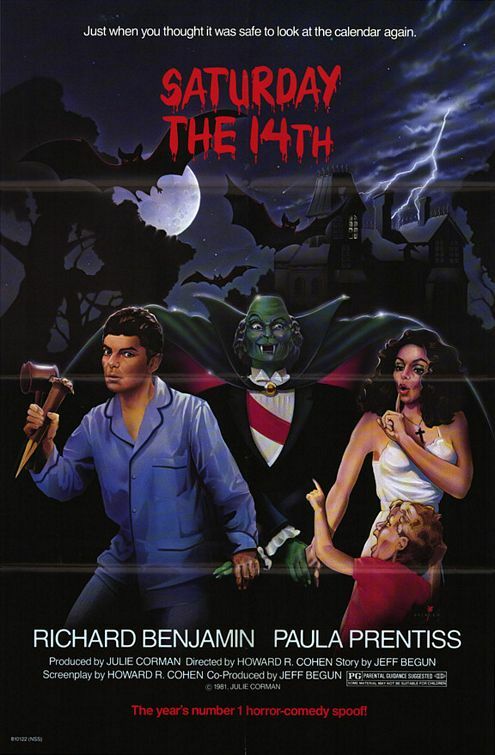 : It’s Saturday the 14th-may I recommend a lazy afternoon viewing of this early 80s cable staple that somehow manages to completely avoid satirizing the Friday the 13th films its name is meant to cash-in on? Instead, Saturday the 14th uses an Old Dark House set-up to bring in a budget Airplane! style spoof of horror movie cliches, covering everything from classic monsters like vampires and gill men to Amityville Horror style haunted house movies to indulging in Cantina style collections of rubbery monsters that kids adore. Yes, the film makes itself a plain product of New World Pictures by giving us an extended bathtub scene with Kari Michaelsen, but otherwise this is the kind of combination of stale, goofy jokes and monsters that your (or at least my) inner ten-year old loves. This entry was posted in Comedy, Horror, Monster, Movie of the Day, Old Dark House, Spoof, The Original, Vampires and tagged annoying children, bath attack, bathtub, before they were famous, cash-in, cursed book, Drive-In, gillman, inheritance, Jeffrey Tambor, Julie Corman, low-budget, New World Pictures, Paula Prentiss, real estate agent, Richard Benjamin, Severn Dardin, sleazy, the declining years.